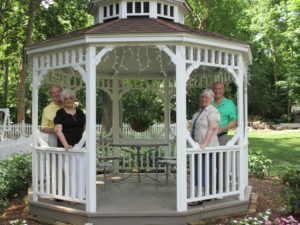 Make plans now to gather at Blessings on State Bed & Breakfast in Jacksonville for a good old-fashioned double date! Spend time catching up on our wrap-around front porch or in the front parlor, with the baby grand piano playing quietly in the background. You and your friends will be our only guests. Go out for burgers and shakes before seeing a first-run movie at one of our local movie theaters. Come back to share cookies and milk at bedtime. Get a good night’s sleep, then come together for a fine-dining gourmet breakfast experience in our formal dining room.